FC Barcelona 2010: Who will be the next president of FC Barcelona? Who will be the next president of FC Barcelona? In May or June next year, Barcelona's club members will appoint a new president. After two terms, current president Joan Laporta cannot run again. Who are the candidates to succeed him? The current Barcelona board wants to put forward one candidate who should continue the current project. In recent weeks and months, this seemed to have become a struggle between marketing vice-president Jaume Ferrer and recently appointed board member Xavier Sala i Martín. While Sala, a professor of economics at Columbia University in New York, would have the support of president Laporta, Ferrer would be backed by the majority of the board members. First vice-president Alfons Godall, who first had said that he would not run, has put himself back on the map in two interviews earlier this week and could become the consensus candidate. A decision is expected to be made in December or January. Rosell is until this moment the only one who has publicly announced - in the summer of 2008 - that he will run for president. He has started to prepare for the elections shortly after he resigned as vice-president in 2005. 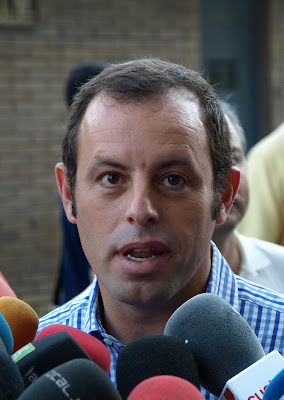 Rosell has long been seen as the favourite to become the next president although this could have changed because of last season's sporting succeses of the team. Rosell is seen as the architect of the team around Brazilian player Ronaldinho that won two league titles and one Champions League under coach Frank Rijkaard. Until he stepped down together with several other board members last summer, Soriano was considered to be the most likely "board candidate" for the elections. Soriano is seen as the architect of the current healthier financial situation of the club, compared to the situation when Laporta took office back in 2003. Because of his new job as chairman of airline company Spanair it has become uncertain if Soriano will run. Several other names of people from the "entorn", the club's entourage, are rumoured to try to set up a candidature. Former presidental candidates like Jordi Majó, Josep Maria Minguella or Jaume Llauradó could again make an attempt, although none of them are expected to have a serious chance and they might try to link up with one of the main candidates trying to get a place in the board. does rosell still get your vote? Wish you the best with this blog! Rosell is the Nike dude? Thanks! And yes, Rosell is the Nike guy. but woulden't he invite many foreingers to the team, I believe he has good contacs in Brazil(dinho-deco) could he ruin the way Barca implement young players in their squad today? And the thing I am most curious about is the economy. I am afraid he migth buy expensive players( we do this today as well) and use money on other projects to raise the clubs debt. What do you think? As I said I don't know this man as much I should. "but woulden't he invite many foreingers to the team, I believe he has good contacs in Brazil(dinho-deco) could he ruin the way Barca implement young players in their squad today?" That's one of the fears among part of the socis. Well, mainly the first part: bringing in many Brazilian players. The only concrete player with whom he's being linked now is Cesc though. "And the thing I am most curious about is the economy. I am afraid he migth buy expensive players( we do this today as well) and use money on other projects to raise the clubs debt. What do you think?" Well, when he was around we certainly bought cheaper than we are doing today (just to give two examples: Ronaldinho 27 millions and Eto'o 24 millions). Although it was back then (2003-2004) probably easier because we were at a low point, he's nevertheless seen as a good negotiator. Rosell cares so much for the club that he releases a tell all book before the 2006 season is over and is basically a Nike Corporate whore who bends wherever the winds blows to accomodate fans. I would love to see Ferran Soriano go for it but think Rosell will still win because he is the more recognized one. I prefer a tell-all book over secretly deals with mafia guys in Uzbekistan, Ukraine and Bolivia, like Laporta has been doing. Don't think there's much to predict at this point. The treble opened the race again. Oh so writing a book that will bring a distraction is ok then in the eyes of the fans? I am sure that many were pleased that a book came out before the champions league final was decided and was a huge distraction is fine too. That's what fans of the club would do, release a book during the season that brings on distractions. Ok then, is this the same Rosell who said we should not have sold Ronaldinho too? The same Rosell who wanted to buy the great sick note players Ayala and Aimar? What do you consider a Nike corporate whore to be, squeeky clean? As for classy, just ask Cocu and Overmars how classy he is regarding the terms of the agreement they signed when they were basically kicked off the team? Rosell también ha comentado que si él llegara a ser presidente del Barcelona, contaría con Deco, Eto'o y Ronaldinho al constituir estos parte del "patrimonio" del club azulgrana. El empresario ha asegurado que ha sido un error que Pep Guardiola dijera públicamente que no contaba con ninguno de los tres porque así ha devaluado el precio de estos futbolistas. Sobre el particular caso de Ronaldinho, Rosell ha dicho que él intentaría recuperarle antes que venderle a precio de saldo, ahora, a cualquier club. Talk about a disaster.. Also said he would sign C Ronaldo to the club. How shameful. Kun Aguero. Guess he wants more selfish egotistic players at the club. Vote for Rosell = vote for Nike corporate whore to sign the selfish divas that the club just got rid of. And let's try to keep the talk decent here, which would include trying to avoid expressions like "corporate whore". Thanks! The guys says he was about to fire Rijkaard and get Big Phil. How is that not stirring things up? I am sure that airing behind closed doors discussions is not exactly being good. Why did he even think that Big Phil would be a good choice? A good VP would have objected to that too and not pursued it. Can't wait to see who his choice of manager would be if Pep decides to coach in the UK. I love the option of all (former) players, coaches and board members only talking with the press in June and July, IBES. But it's not very possible. And professional players should be able to deal with press talk without too many problems. As was demonstrated in 2006. Creating a controversy though is not something a fan nor a would be president should be doing to his club either if the club comes first, wouldn't you agree? In a club like Barcelona you cannot avoid controversy, IBES. Almost every time Laporta speaks there's also controversy. I would prefer nobody speaks, like I mention above, but that's not possible, so it's all about how the team deals with it. And I honestly don't think the players care much about what is going on in the press or in the board room. copyright © barcaelections2010.blogspot.com - all rights reserved. all articles on this blog are copyrighted, unless stated otherwise. the copyright forbids you to reproduce or distribute any material anywhere on the internet or offline without a permission and consent from the author, though you may link to articles and post with brief excerpts. The best club team in the history of football.